Wade's....England... 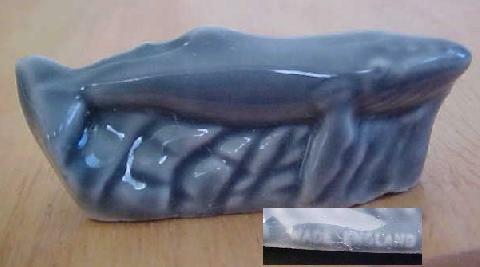 Endangered Species Collection...1992-2002... Humpback Whale Figurine. Marked on the side "Wade England". Blue glazed humpback whale figurine features humpback whale swimming. Figurine measures approximately 1 1/8" high x 1 1/8" wide. Complete your set of the Wade Figurine Endangered Species Collection with this humpback whale! These figurines were designed to help focus attention on conservation efforts to protect these treasured animals and the responsibility each of us has to protect them. There are no nicks, chips or cracks. All of my Wade Figurines have some "roughness" about them around the bottom base, but these are not chips/nicks, rather, manufacturing flaws! In good, used condition.